LILD/PUC-Rio. Mechanical tests with a prototype carried out at PUC-Rio. those with walking problems at LILD/PUC-Rio in cooperation with CVI. the cable tension system Tensegrity. World Bamboo Congress in 1998. 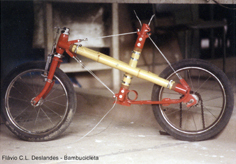 1996-98 The second bamboobike prototype with the cable tension system. Student graduation project at PUC-Rio in 1999. 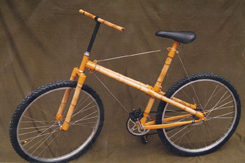 1996-98 Bamboobike composite, composed by bamboo fibers and resin. integrated into two single bamboo-tubes in parallel. inside a lug and tensioned by cable. for cyclists of Copenhagen city. and then a model with a 'pushing the bamboo to an extreme' left-single-fork. nr.4 with two extra bamboo top and down tubes for more stiffness. around the world to the possibilities that this natural material could offer. 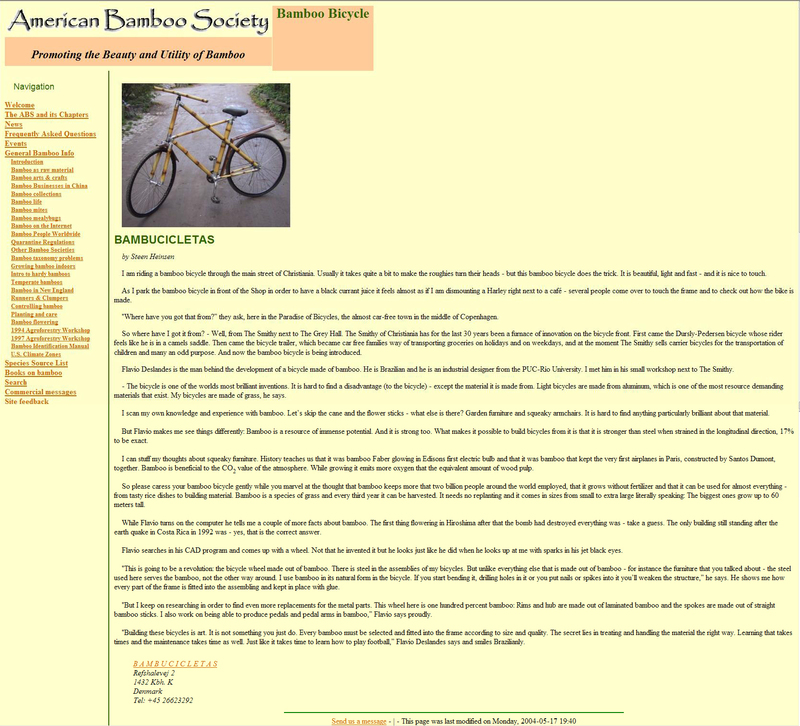 bamboobike in the AmericanBambooSociety website until 2004. 2000 Bambucicletas fenders. Made out of bamboo tubes simply split in two. 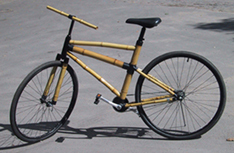 2001 City bamboobike with a black bamboo frame, based on prototype nr.6. with Biomega and designer Ross-Lovegrove. then an aerodynamic designed handlebar. 2003-04 Bamboobike prototype nr.8 with a handmade metal lugs. 2004-05 Bamboobike prototype nr.9 with a handmade carbon lugs. 2006 Bamboobike prototype for Viva-bikes. 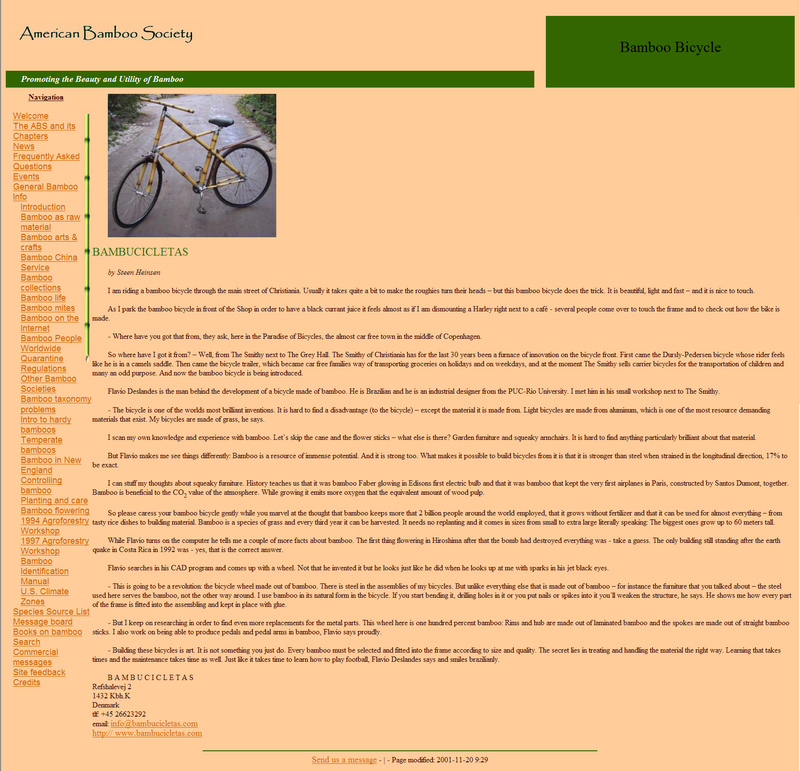 2007 Bamboobike prototype made for biking tests purpose. Dec 2008. Bamboo technology, engineering and manufacturing for Biomega. 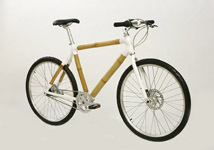 2009 Biomega bamboobike start to reach the stores around the world. upright riding experience and a unique look. 2010 Bamboobike Dutch style, with baloon tires. Flavio Costa Leão Deslandes is a Brazilian Industrial Designer based in Denmark. 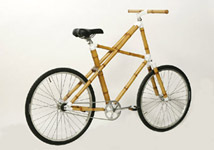 He is known for his design and engineering work with bamboo, including the bamboo bicycle. 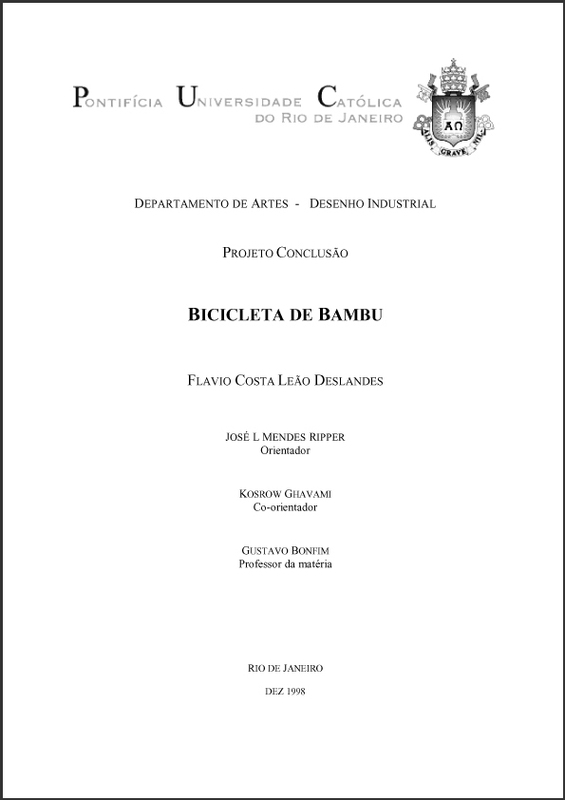 In Rio de Janeiro in 1994 Flavio began his scientific research with bamboo technology with a research grant during his University studies at PUC-Rio. From 1994 to 1998 he participated in projects about developing tools for working with bamboo – composites, structures, truss-frames, joint and connection solutions, aids and appliances for handicapped such as walkers and amphibian sliders. 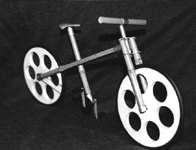 In 1995 he started developing his first bamboo bicycle and the first prototype was presented at the 5º International World Bamboo Congress in 1998. 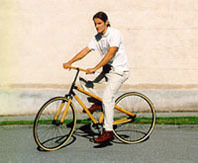 He graduated in 1999, his bamboo bicycle prototype nr.2 being the final project. His first patent MU7901320-1 was applied in 1999 and granted in 2005. 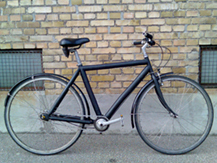 In 2000 Flavio moved to Copenhagen, Denmark to a whole new world of bicycles and biking culture. Since then Flavio has been working for several companies in the bicycle industry - with mechanics, frame building, product development and design. And he has been building both conventional bikes and bamboo bikes for private clients. 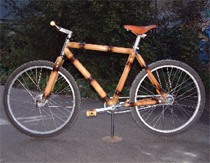 In 2000 Flavio developed a bamboo bicycle with a special frame design combining an upright riding position and a great use of bamboo tubes, providing a comfortable ride. This bike attracted attention from all over the world because of its exclusive look, comfort frame geometry, sustainable aspects and the audacity to use a great number of bamboo in its frame and components. 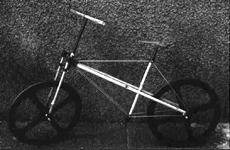 The bike was acclaimed 'today's bicycle design' in 2002 in the book "What Is Design Today" by George H. Marcus. 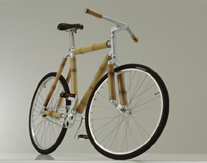 In 2001 Flavio participated in the development of a bamboo bike with Biomega and designer Ross Lovegrove. Flavio developed the crucial joint between the bamboo tubes and the aluminum lugs including an aluminum ring, a surface treatment for the bamboos and the engineering of the frame. In 2008 the bike was tested at CHC/Taiwan, approved and certified according to European standards EN14764. Year 2009 Flavio started the production with Biomega. "From the beginning I have felt that this exquisite material - an organic tube structure made by nature - has a tremendous potential. The challenge to make it work has kept me going. My motivation was always the opportunity to connect modern design with natural materials. The idea to make this connection in a bicycle is logical if you think about it: Biking is a very energy effective way of transportation. 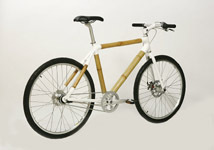 And combining a sustainable material as bamboo with energy free mobility seems like the right thing to do." I am riding a bamboo bicycle through the main street of Christiania. 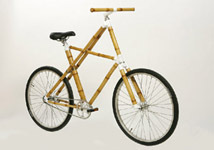 Usually it takes quite a bit to make the roughies turn their heads - but this bamboo bicycle does the trick. It is beautiful, light and fast - and it is nice to touch. As I park the bamboo bicycle in front of the Shop in order to have a black currant juice it feels almost as if I am dismounting a Harley right next to a café - several people come over to touch the frame and to check out how the bike is made. "Where have you got that from?” they ask, here in the Paradise of Bicycles, the almost car-free town in the middle of Copenhagen. So where have I got it from? - Well, from The Smithy next to The Grey Hall. The Smithy of Christiania has for the last 30 years been a furnace of innovation on the bicycle front. First came the Dursly-Pedersen bicycle whose rider feels like he is in a camels saddle. Then came the bicycle trailer, which became car free families way of transporting groceries on holidays and on weekdays, and at the moment The Smithy sells carrier bicycles for the transportation of children and many an odd purpose. And now the bamboo bicycle is being introduced. 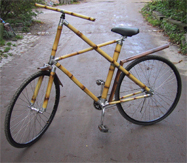 Flavio Deslandes is the man behind the development of a bicycle made of bamboo. He is Brazilian and he is an industrial designer from the PUC-Rio University. I met him in his small workshop next to The Smithy. - The bicycle is one of the worlds most brilliant inventions. It is hard to find a disadvantage (to the bicycle) - except the material it is made from. Light bicycles are made from aluminum, which is one of the most resource demanding materials that exist. My bicycles are made of grass, he says. I scan my own knowledge and experience with bamboo. Let’s skip the cane and the flower sticks - what else is there? Garden furniture and squeaky armchairs. It is hard to find anything particularly brilliant about that material. But Flavio makes me see things differently: Bamboo is a resource of immense potential. And it is strong too. What makes it possible to build bicycles from it is that it is stronger than steel when strained in the longitudinal direction, 17% to be exact. I can stuff my thoughts about squeaky furniture. History teaches us that it was bamboo Faber glowing in Edisons first electric bulb and that it was bamboo that kept the very first airplanes in Paris, constructed by Santos Dumont, together. Bamboo is beneficial to the CO2 value of the atmosphere. While growing it emits more oxygen that the equivalent amount of wood pulp. So please caress your bamboo bicycle gently while you marvel at the thought that bamboo keeps more that two billion people around the world employed, that it grows without fertilizer and that it can be used for almost everything - from tasty rice dishes to building material. Bamboo is a species of grass and every third year it can be harvested. It needs no replanting and it comes in sizes from small to extra large literally speaking: The biggest ones grow up to 60 meters tall. While Flavio turns on the computer he tells me a couple of more facts about bamboo. The first thing flowering in Hiroshima after that the bomb had destroyed everything was - take a guess. The only building still standing after the earth quake in Costa Rica in 1992 was - yes, that is the correct answer. Flavio searches in his CAD program and comes up with a wheel. Not that he invented it but he looks just like he did when he looks up at me with sparks in his jet black eyes. 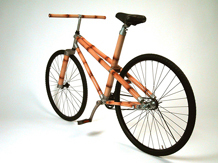 "This is going to be a revolution: the bicycle wheel made out of bamboo. There is steel in the assemblies of my bicycles. But unlike everything else that is made out of bamboo - for instance the furniture that you talked about - the steel used here serves the bamboo, not the other way around. 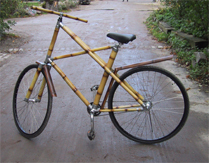 I use bamboo in its natural form in the bicycle. If you start bending it, drilling holes in it or you put nails or spikes into it you’ll weaken the structure,” he says. He shows me how every part of the frame is fitted into the assembling and kept in place with glue. "But I keep on researching in order to find even more replacements for the metal parts. This wheel here is one hundred percent bamboo: Rims and hub are made out of laminated bamboo and the spokes are made out of straight bamboo sticks. I also work on being able to produce pedals and pedal arms in bamboo,” Flavio says proudly. "Building these bicycles is art. It is not something you just do. Every bamboo must be selected and fitted into the frame according to size and quality. The secret lies in treating and handling the material the right way. Learning that takes times and the maintenance takes time as well. Just like it takes time to learn how to play football,” Flavio Deslandes says and smiles Brazilianly.